September doesn’t matter more than any other month. We are not even halfway through September, and the fates of two of MLB’s biggest contenders seem to be sealed. The Los Angeles Dodgers — historically dominant for most of the summer — now lie in ruin. The Cleveland Indians, meanwhile, are now an unstoppable juggernaut that is destined to win the franchise’s first World Series title since 1948. That, at least, is what casual baseball fans might think if they’re just checking in to what’s happening in the stretch run of the season. But in truth, what happens in MLB in September tends to stay in September. Although a hot month can add to our understanding of a team’s chances in October, the idea of late-season momentum remains a myth. Of course, it’s easy to get worked up about late-season streaks. Just when it looked like the 2017 MLB regular season might cruise to the finish line, these two playoff-bound teams decided to rattle off double-digit streaks in September — 11 straight losses for the Los Angeles Dodgers and 19 straight wins for the Indians. The pair of runs has reshaped the World Series race and helped resuscitate the old debate about momentum going into the playoffs. When Jonah Keri and I looked at that topic a few years ago, what we found basically reinforced the traditional sabermetric party line — that teams’ late-season winning percentages aren’t overly predictive of their playoff success. Winning percentage, however, is a very broad measure of performance, subject to all kinds of distorting factors. Perhaps if we looked at something like FiveThirtyEight’s Elo ratings –– which account for a variety of factors, including opponent strength, margin of victory and the starting pitchers in each game — we’d get a different take on the significance of late-season streaks. However, these hot and cold streaks could have happened in April, May or June, and they’d have had the same effect — we’d just be talking about the arc of each team’s season differently. 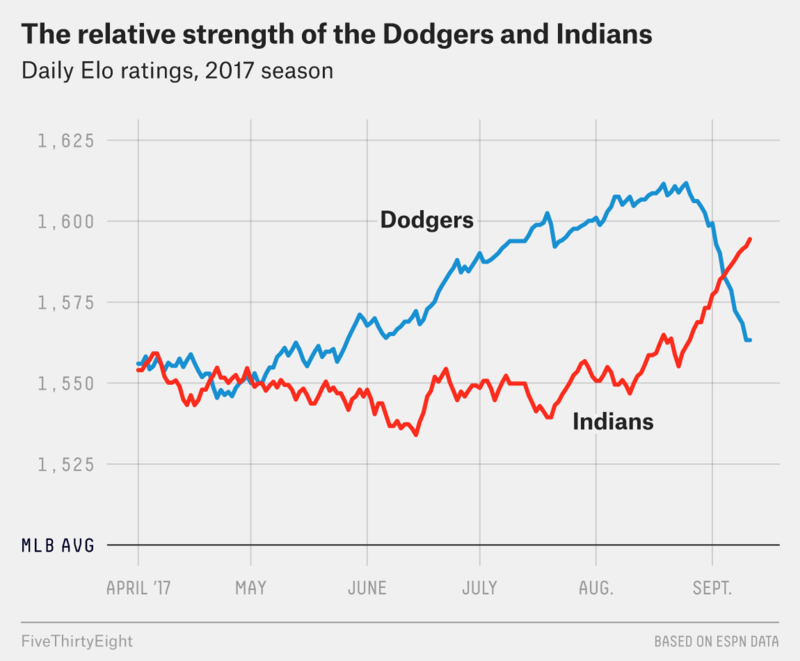 (Indeed, the Dodgers ran off a ridiculously hot stretch at midseason, during which their Elo rating peaked higher than Cleveland’s is right now, and the Indians spent much of the season’s first half underachieving.) As always, one of the only things that really matters when predicting the playoffs — to the extent that anything helps in that department — is a team’s full-season résumé, including both the red-hot win streaks and ice-cold losing skids, whenever they occur. Keep that in mind as the postseason rolls around in three weeks. Momentum is nice, and the Indians will probably stand as the best team in baseball heading into the playoffs. But it will be on the strength of their full body of work this season, not just a hot September. (Likewise, the Dodgers will still rank among the handful of top teams in MLB, losing streak be damned.) And in many ways, each team will only be as good as who they’re sending to the mound to start the next ballgame. So, no wild card play-in games. The first full, 162-game season of MLB’s wild-card era. Not only are the Dodgers not No. 1 anymore, but they’ve also been passed for No. 2 by the Washington Nationals — and the New York Yankees and Boston Red Sox aren’t far behind, either.